At the beginning of this period the Regiment minus the 2nd Battalion was in a defensive position in vicinity of Todten Bruch. ( SE of Zweifall). The 1st Battalion defending to the east covering the battalion front, right flank at (995326) to left flank at (996334). The 3rd Battalion is to the south defending the road running Southeast to Northwest, the battalion front covered from right flank at (992314) to left flank at (991319). On the 2 October 1944, an enemy attack to the north of the Regimental area was deemed critical enough to send the 1st Battalion with the mission of helping the 298th Engineer Battalion, which was responsible for this area. At darkness the enemy had been repulsed and the situation restored. The 2nd Battalion reverted to Regimental control on this day, and took up defensive positions of the 1st Battalion sector while the latter was repulsing the enemy attack in the 298th Engineer Battalion area. The next day extensive patrolling was conducted and on the 4th October 1944, the 1st Battalion was relieved from its mission, and returned to assembly area in vicinity of (977345). The 2nd Battalion and the 3rd Battalion conducted normal patrolling and security measures were placed in operations. The 1st Battalion moved to an assembly area behind the 2nd Battalion in preparation for an attack on the 5th October 1944, but the attack was called off and normal patrolling was continued, the 2nd and 3rd Battalions remaining in place. The Combat Team on the 6th October 1944, under orders to continue the attack to the east jumped off at 1130 hours, preceded by one hour air preparation and five minutes artillery preparations. The 2nd Battalion reached a point 1000 yards short of its objective before being stopped by heavy small arms, mortar and artillery fires. This Battalion dug in for the night, their right flank at (004325), left flank at (007330). Initially the 1st Battalion followed to the right rear of the 2nd Battalion and was engaged in action with the enemy to its right. 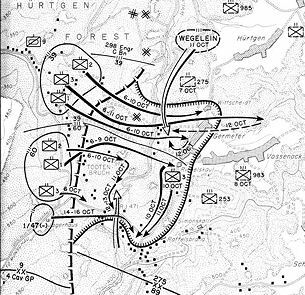 The 1st Battalion was withdrawn and maneuvered to a flanking position from the north, gaining this position (004339) by nightfall and immediately prepared to continue the assault the next day. The 3rd Battalion, with the mission of diverting the enemy, moved to the east and became involved with the enemy on its left flank, dug in for the night in vicinity of (996314). On the 7th October 1944, the Regiment continued its attack commencing at 0755 hours, with the 1st Battalion reaching a position short about 400 yards of the north-south road of GERMETER. The 2nd Battalion furnished the 1st Battalion with supporting fires, and the 3rd Battalion positions remained the same. During this action the 39th infantry was on the Regiment left flank and the Fourth Cavalry Group on the right flank. After a strong enemy attack from the east, the 1st and 2nd battalions at 0800 hrs, 8 October 1944, continued the attack and immediately met heavy resistance consisting of small arms, mortars and artillery fires. Numerous personnel and antitank mine fields were encountered. Little ground was gained but strong enemy attacks that came at various times during the day, were successfully repulsed. The attack jumped off at 0700 hrs on the 9th of October 1944, and the 1st Battalion, against stiff resistance, pushed down to the GERMETER Road and held this position against several counter attacks coming from the southeast. The 2nd Battalion in attacking established its left flank as follows: right flank at (003323) and left flank at (011325). In preparation for the next day's attack the 3rd Battalion was ordered into an assembly area to the rear of the 1st Battalion, in vicinity of (992330), gaining this position by 1800 hours. With the 2nd Battalion holding, and the 3rd Battalion following, the 1st Battalion attacked on the 10th October 1944, to secure an objective to the south. Progress was steady and by 1300 hours, the 1st Battalion was on its objective, with the 3rd Battalion 1 km to the north. Position at nightfall were: 1st Battalion astride the CR at (010305). 3rd Battalion in vicinity of RJ at (019324). 2nd Battalion remaining the same. Adjacent units remained the same. The 1st Battalion was harassed by infiltrating patrols throughout the night and early the next morning, a strong enemy attack was repulsed at approximately 0750 hours on the 11th October 1944. By 1300 hours, the 3rd Battalion reinforced the 1st Battalion and immediately became engaged with the enemy to the southeast and southwest. The 2nd Battalion in an attack gained ground against stubborn enemy resistance, at dusk 2nd Battalion front was as follows: right flank (000320), left flank (006318). The 1st Battalion and 3rd Battalion, on the 12th October 1944, were ordered to hold and remain in present positions. The 2nd Battalion jumped off at 1000 hours to attack south but immediately met an enemy attack in force. This attack was repulsed but no ground was gained toward the objective. The 1st Battalion captured two pillboxes and extended their lines to the south on the afternoon operations. Numerous enemy attacks were launched on all sectors and much infiltration was reported, enemy artillery and mortar fires increased and it was noted that resistance had stiffened.